You obviously will know about the horsey in the national diet if you are British, on the assumption that you have not been away on Mars for the past few weeks. 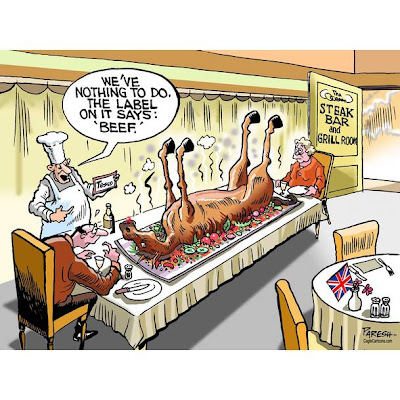 For the rest of the world, those who are blissfully ignorant of these shores, let me just say that the British public, or the poorer part of it, was being fed horse meat pretending to be beef. Shocking! Shocking! Mind you, I’m not convinced that those who buy tripe (possibly?) like Findus’ or Tesco’s deep frozen lasagne really know or care what they are eating, so long as it has a meaty taste. Then there are the burgers. Lord alone knows what’s in those. Actually, we do know – udders, guts, sexual parts, all rendered down; revolting enough, even when it is not horse. There was a readers’ poll in the Daily Telegraph recently arising from the horse meat scandal. The question was simple: do you think it acceptable to eat horse meat or not? I voted no, because I would no more eat horse than I would eat cat or rat. Rat, yes, this is something I will come on to in a bit or a bite. The result of the poll - revealed after one had voted - was almost neck and neck, the antis winning by a mere nose. So, whether or not the pros actually eat horse burgers they do not think there is anything wrong in principle here. Oh, but there is. First of all the issue is about honesty. I know one virtually has to have a PhD now to make sense of the labelling on food products, but at the most basic level people have a right to know if they are eating beef or dog meat. If they have a preference for dog that’s fine, just as long as they understand what it is they are buying. I say dog, knowing full well that the Telegraph poll would have produced a far clearer result if that had been the product in question, though there are some places in the world where dog is considered tasty and nutritious. The real issue, the issue that is beyond the comprehension of the unimaginative, is that of adulteration; of the corruption of food, a corruption born of the drive to feed the masses with the cheapest product available. “Let them eat cake”, Marie Antoinette is falsely alleged to have said. But that is positively benign compared with the “Let them eat crap” of the modern food Tsars. 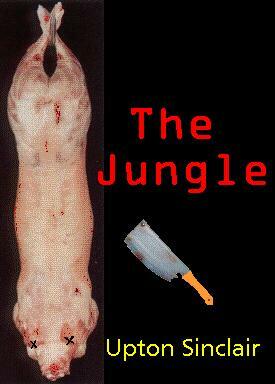 Upton Sinclair caught the mood in The Jungle, a novel published in 1906, which described the dreadful conditions in the meat packing industry. But sick lamb pretending to be chicken was not enough for him; oh, no. He went that step further, claiming that the workers who had the misfortune to fall into the rendering tanks were ground up and sold with the rest as Durham’s Pure Beef Lard! We have come a long way since then, with legislation and inspection aimed at reducing corruption (meat) and corruption (human). No we have not. If anything the situation is getting worse. Corruption, in one form or another, is the name of a pretty dirty game; and when it comes to meat things can get an awful lot dirtier. It’s not really that long since England was beset by the BSE crisis, when it was discovered that rendered meat products was being fed to cattle, with disastrous human results. We learned from that that we clearly learned nothing. For now horse is in the stakes and the steaks. Given that the world trade in bushmeat is now vast, why not add bush fat of baboon? What’s to keep out the meat that has been assigned for pet food? Why not meat that has been condemned? What guarantees can be given? None, it would appear, though we have had a Food Standards Agency in England for the past twelve years, a guarantor that clearly guarantees nothing. Then there are the supermarket chains like Findus and Tesco, who have singularly failed to investigate their suppliers. Then there are the politicians, who assure us that our meat is ‘safe’ when they know full well that, as a member of the European Union, we as a country have no proper control over the product that comes from the Continent. Horse meat today; cat or rat tomorrow. I think there is a strong element of cynicism here. As I say, the horse to watch is Profit. The poor - and it is the poor - are the principle victims of our two for one deep frozen food culture. In the wake of the horse fiasco, super market chiefs are saying that their products are likely to become more expensive, that the days of cheap food are over. This suggests to me that they already knew that there was something fishy, make that horsey, about the stuff they were selling, that or they simply did not ask too many pertinent questions. Get ‘beef’ from Mexico or Bulgaria rather than local suppliers – why not? It’s cheap and goes very well in burgers and lasagne. This is a story, as Tudge says, that might turn nastier yet. The world food chain is out of control, or falling in to the control of unscrupulous profiteers, pirates of all sorts, the sort of people who only care about Profit, the one horse they do not want to see fall. Inevitably the scandal will settle down as cosmetic changes are made, as politicians issue further assurances and standards are supposedly raised, as the public’s fickle attention turns to some other tale of woe. Those who have become veggies, fearful of eating horse, will return to meat. The pendulum will swing the other way in this best of all possible worlds. At least until it is discovered that the benighted public have been eating something a lot less benign than horse. 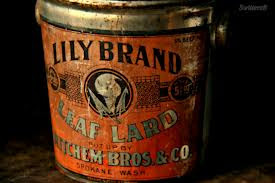 In the meantime I would strongly urge you to avoid Durham’s Pure Beef Lard. Whatever it takes to keep the poor from eating the rich. Anthony, I'm reminded of A Modest Proposal for Preventing the Children of Poor People From Being a Burden to Their Parents or Country, and for Making Them Beneficial to the Publick, a brilliant satire by Jonathan Swift. This is not a problem for those of us who hunt or who buy a whole animal direct from the farmer, and have the beasts butchered by a reliable local processor. But animal protein reared and marketed on an industrial scale is a very different matter. I have read that large scale egg producers will kill their birds after they cease to be efficient, then flash-freeze the carcasses and bulk ship them to China to be cleaned and butchered because labour is so much cheaper there, before the parts are transported back to the US for sale in supermarkets or through fast-food outlets. There are further dangers in the high-density production of cattle and pigs due to the use of high concentrations of antibiotics and other drugs to prevent disease and promote quick growth. And yet, our average life-expectancy at birth in 1900 was around 40, and is now approaching 80 . . . assuming that is a good thing. On the other hand, fertility rates in the West are dropping to non-replacement levels. Perhaps our lifestyle of cheap, safe, convenient food makes life less worth living. Ah, Calvin, for a great many, yes, day after day of the same futile things...and Bird's Eye frozen lasagne. An Uncle of mine worked at a huge meat processing plant near my city -Swift, originally owned by a British conglomerate, now owned by a Brazilian company-; he told us that a worker once fell into a large machine that grinds meat into the paste found in so many processed meat products. Needless to say, the worker died; needless to say, the meat was not thrown away. This happened 25-30 years ago, but it still keeps me from eating sausages! As for horse meat, we are the second largest world producers, even though we share your dislike of it as food. Supposedly most of it is exported, and since most of our meat goes to the EU and Russia, so it is not unlikely that it found its way to these cheap, processed meals. So, Wilson, it's true?! I thought Sinclair was exaggerating. I know that a lot of the horse product comes from Mexico via the US, but Argentina is another possibility. PS, I will never eat another sausage! In the US we have the FDA ( Food and Drug Administration ) This agency oversees food and drug processing, There is also the USDA ( US department of agriculture ) which oversees crops and livestock. These agencies usually do a fairly good job of keeping the food supply relatively safe for consumers. There are occasions of tainted food products with people becoming ill or some deaths but this is kept to a minimum considering the size of the US population and defective foods or drugs are recalled from retail and notices given to the public, The system is not perfect but it works fairly well. There are reputable food outlets that have high standards and their own product inspection processes. Now with GMO crops and drug production there is a lot of politics involved, so as with all else, consumer beware and do your research. Yes, we are supposed to have similar quality controls but clearly they have failed. It's good that you are able to trust the FDA. But, yes, always, always, caveat emptor. So you wouldn't eat hosrse but you would eat other animals? That's a little bit weird if I'm completely honest. Not at all, Ajax. Let me give you the same answer that I did elsewhere. No I won’t eat horse, any more than I would eat dog. I have a long companionship with horses. I’ve been riding since I was six years old. I have my own mount, with whom I go hacking at least once a week, often more when I can afford the time, as well as hunting in season. I do eat meat, though. I’ve even killed some of the meat I have eaten, a more authentic experience than popping along to the local butcher. Am I a hypocrite? Yes, possibly, but we are all defined in one way or other by the limits of what is and what is not acceptable. I will not eat horse, I will not eat dog, I will not eat cat, I will not eat rat, even when it comes on two legs, though I dare say somebody or other will have ‘tasty recipe’ for those also. The thing is, though, thinking of the wider scandal, the horse burgers have totally missed the point; the point being honesty, and the point being the criminal adulteration of the food chain. The blatant misrepresentation of consumer products should also be a criminal matter as it is over here.